In this randomized, double-blind, crossover study, patients with stable COPD and moderate-to-severe airflow limitation received aclidinium 400 μg twice daily or placebo via Genuair®/Pressair® a for 3 weeks (2-week washout between treatment periods). The primary endpoint was change from baseline to Week 3 in endurance time, measured by constant work rate cycle ergometry testing at 75% peak incremental work rate. Changes from baseline in intensity of exertional dyspnea (Borg CR10 Scale®) and trough inspiratory capacity were secondary endpoints. Additional endpoints included changes from baseline in other spirometric, plethysmographic, and physical activity (assessed by objective accelerometer measurement) parameters. Efficacy endpoints were analyzed using an analysis of covariance model. Exercise limitation, driven predominantly by activity-related dyspnea, is an important feature of chronic obstructive pulmonary disease (COPD) that compromises daily living activities, leads to physical deconditioning, and contributes to a reduced perceived quality of life [1–6]. Lung hyperinflation is thought to represent a mechanical link between the characteristic expiratory airflow impairment, dyspnea, and exercise capacity [5, 6]. In patients with COPD, expiratory flow limitation and reduced lung elastic recoil result in air trapping and an increased end-expiratory lung volume (EELV) compared with healthy individuals [5–8]. During physical activity, acute increases in EELV (dynamic hyperinflation) occur and dyspnea is exacerbated, which can lead to avoidance of activity [5–8]. Alleviating hyperinflation and improving dyspnea, exercise tolerance, and levels of physical activity are important therapeutic goals in the management of COPD . While there is a large body of clinical evidence regarding the effect of long-acting bronchodilators, including long-acting muscarinic antagonists (LAMAs), on exercise endurance [10–13], little is known about the translation of such improvements into changes in everyday physical activity. Aclidinium bromide is a novel LAMA recently approved, at a dose of 400 μg twice daily (BID), as a treatment for COPD [14, 15]. 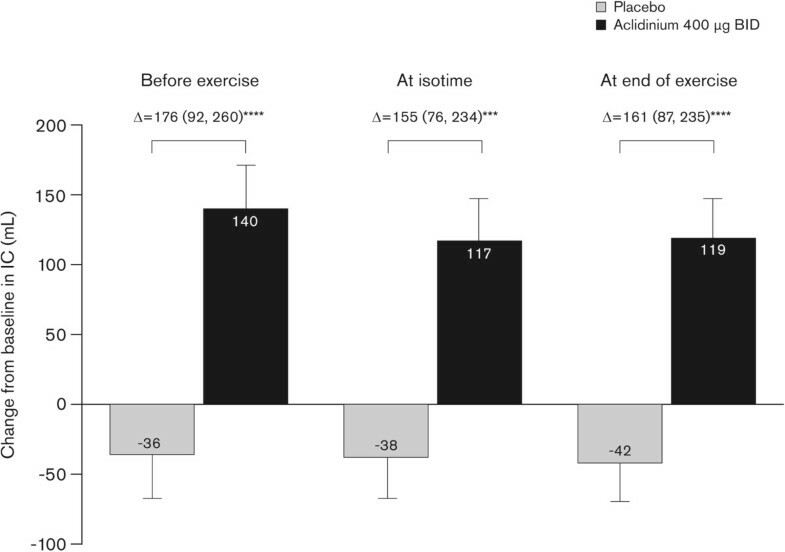 In a previous study, aclidinium 200 μg once daily (QD) significantly improved exercise endurance time, exertional dyspnea, and static hyperinflation versus placebo in patients with COPD . Here we report results from a randomized, double-blind Phase IIIb crossover study to evaluate the effect of aclidinium 400 μg BID on cycling exercise endurance, exertional dyspnea, and lung hyperinflation in patients with COPD. A thorough profiling of lung volumes and objective measures of daily physical activity are also included. 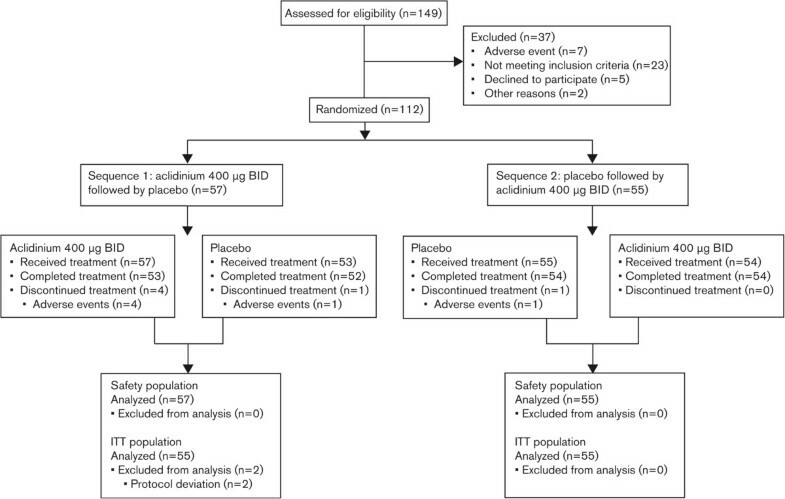 Aclidinium and matched placebo were administered BID (09:00 ± 1 h and 21:00 ± 1 h) via a dry powder inhaler (Genuair®/Pressair® a). Randomization was performed according to unique patient identification numbers and a computer-generated random allocation sequence; patients and investigators were blinded to treatment allocation throughout the study. 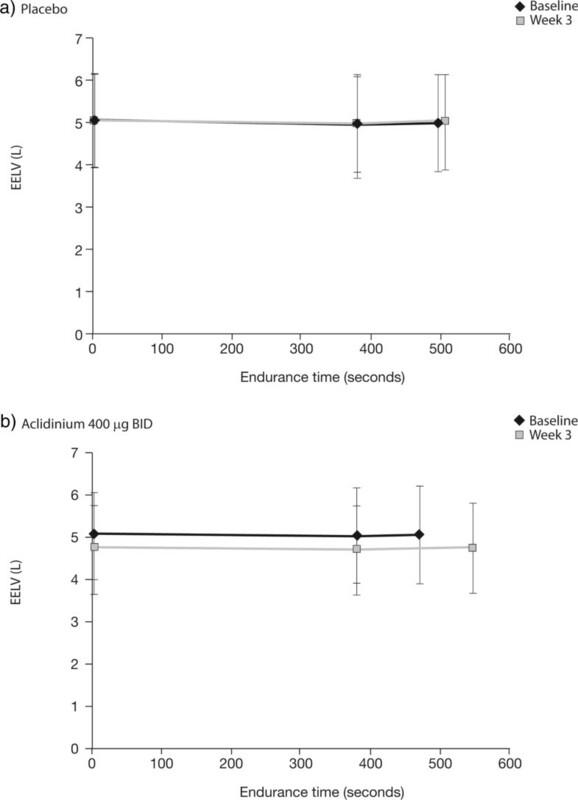 The results of this study show that after 3 weeks, aclidinium 400 μg BID significantly reduced the intensity of exertional dyspnea and improved cycling exercise endurance compared with placebo. 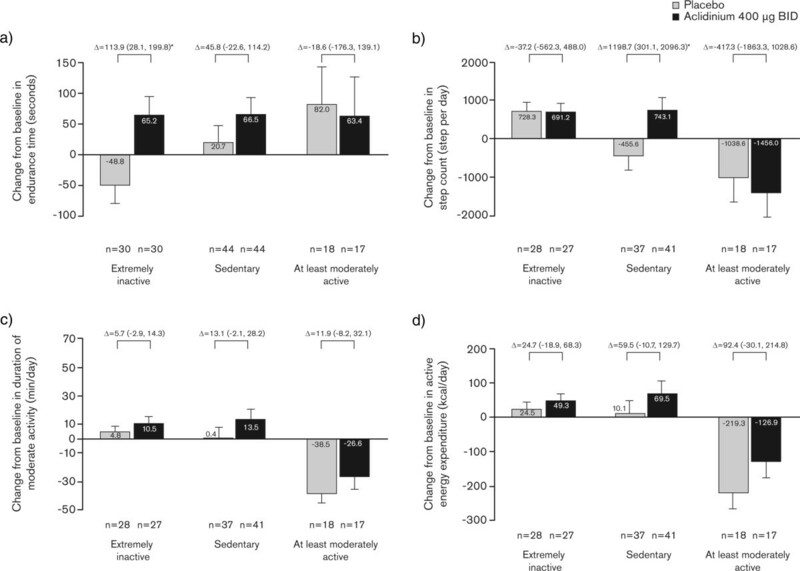 As lung hyperinflation is believed to be an important factor contributing to reduced exercise capacity in COPD [5–8], we believe the main driver of increased exercise endurance was the consistent effect of aclidinium treatment on lung volumes, as reflected by significant improvements in static IC, FRC, RV, and TLC, as well as dynamic IC during exercise. Study limitations might include the short treatment duration, absence of assessments beyond 3 h post-dose to determine duration of effect, and the lack of an active comparator. 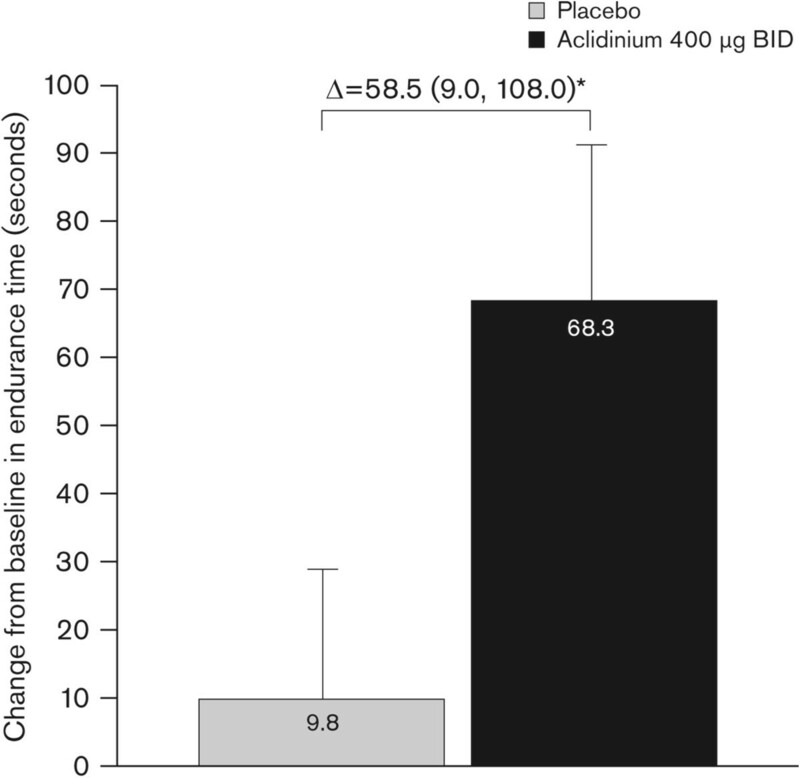 Nevertheless, this study provides useful data to supplement findings from previous Phase III studies, demonstrating that aclidinium significantly improved lung function and symptoms versus placebo over 12 and 24 weeks and had comparable 24-h bronchodilatory efficacy to tiotropium over 6 weeks in patients with COPD [28–30]. Aclidinium has also been demonstrated to be safe and well tolerated in patients with COPD [29, 30], and the safety findings from this short study were consistent with those previously observed.